Translations create new moments in literary history, as we know from our textbook story of poetic modernism in the West. Ezra Pound’s translations of classical Chinese poetry in Cathay (1915), based on Ernest Fenollosa’s manuscripts, which he edited and published as “The Chinese Written Character as a Medium for Poetry” in 1919, profoundly shaped the future of Anglo-American lyric poetry. Though both, with their lack of Chinese, embodied what Derrida calls a “European hallucination” of another tradition’s writing, Pound’s call to “make it new” via cross-cultural pollination suggests translation’s use for the mutability of literary forms. Forty years later, in the late 1960s, the peripheral literature of Chinese Malaysians, or Mahua literature, as locals call it, marked its own translation event of poetic modernism. In 1967, Tan Swie Hian translated Russian poet Boris Pasternak’s “Variation no. 3” in mainstream newspaper Nanyang Siang Pau’s literary supplement, Wenyi. Pasternak’s poem, sometimes loosely translated as “The Racing Stars,” evokes the archaic, classical imagery of the creation myth of Pushkin’s poem, “The Prophet.” Indeed, Tan’s translation was a self-conscious comment on the generative forces in Mahua literary history. It foreshadowed Mahua modernist literature’s ambitious transculturation of world literature. In plurilingual Malaysia, dialectal forms of Malay, Chinese topolects, English, Tamil, and other languages jostle in public spaces like the bazaar and the street. Yet such code-switching and fertile crossovers are limited to ephemeral speech acts, seldom making their way into written realms. Mahua literature has experimented with ways to reflect this linguistic playground, but mostly the impulse to “Malayanize” or become local is understood as a transformation of its literature’s China-oriented consciousness to one reflecting local concerns. This desire, manifested as the Malayan project, was especially acute when colonial Malaya gained independence from British rule in 1957 and became Malaysia in 1963. However, Mahua literature remains a peripheral tradition in today’s Malaysia, whose national language is Malay. Its survival and development rely on its ethnic Chinese population’s political battles for vernacular education and active interest in the literature and language. Sometimes condemned as an “ethnic literature” of a minority ethnic group not properly integrated into a “national culture,” Mahua literature faces constant questions of self-definition and autonomy. Looking at key moments from Mahua’s translational modernist archive from the 1950s to 1980, we suggest that Mahua modernism’s true legacy is its translational vitality and openness. “Incomplete modernism,” as Mahua scholar Tee Kim Tong calls it, is then Mahua modernism’s unfulfilled potential for linguistic hybridity through local and global literary influences to disrupt reified cultural imaginaries. Mahua poetic modernism’s birth through translation could even be considered within the long, vexed history of translation in colonial and postcolonial Southeast Asia. From Sinologist and Protestant missionary Robert Morrison’s translation of the bible into Chinese in Dutch Malacca (currently part of Malaysia), to the British Colonial Office’s releasing of Chinese-language pamphlets from the sky into the jungles to exhort the Malayan communists in hiding to surrender during the Emergency (1948–60), translation was often crucial in the promotion of ideological interests and cultural literacy of an Other secluded by language. Beyond religion and politics, literary texts were translated for reading pleasure by local actors in the region. From around 1889 to 1950, Sino-Malay printing presses in Dutch Indonesia published numerous translations of classical Chinese novels and pulp fiction in Baba Malay, a creole Malay spoken by Straits-born Chinese. Closer to the heady days of decolonization and national independence in post-1950s literary Mahua, translations into and from Chinese became applicable within the framework of the Malayan project. Introduced in literary journals and newspaper supplements by a coterie of poets, Mahua modernist poetry experienced its flowering during the late 1950s, and heyday in the late ‘60s and ‘70s in poetry organizations established in Malaysia and overseas, and its eventual waning in the 1980s. However, it did not get widespread recognition during its most active periods, since an avowedly “leftist social-realist literary ideology” (as Tee puts it) dominated the scene during the 1960s and ‘70s. This Mahua establishment saw itself as successor to mainland China’s anti-imperialist vernacular literature that arose during the May Fourth movement of 1919, and its social-realist discourses of “saving the nation.” Writers like Fang Bei Fang, Miao Xiu, Fang Tian, Wei Yun, and Fang Xiu published realist works indebted to this tradition in the literary supplements of mainstream newspapers like Nanyang Siang Pau and Sin Chew Jit Poh, but reflecting a Malayan consciousness. Reacting against realist trends and classical-style formal poetry, Mahua modernist poetry, at its germination, was open to multiple sources for inspiration to define its program. Translation was an especially important tool for modernist poets to access other literary resources. Mahua literature’s relationship to foreign texts deepened when in 1969, Tan Swie Hian joined the editorial board of Chao Foon, of which Bai Yao was already a part. As founding figures of what was later called the “generation of 1968,” Tan and Liang inspired literary practitioners from Malaysia and Singapore to edit and write for literary supplements and magazines, and establish the modernist, translation-oriented “May Poetry Society.” As a measure of their ambitions to translate, in 1970, Liang serialized his Chinese translations of Ulysses, alongside translations of and articles on Stéphane Mallarmé, Samuel Beckett, Anthony Burgess, and Henry Miller. At the height of its translation activities in 1970, Chao Foon dedicated multiple issues to introduce important figures from world literature in Chinese, including Yukio Mishima’s short stories, Vaslav Nijinsky’s diaries, Henri Michaux’s poems, contemporary Greek poetry from the ‘60s, and Aleksandr Solzhenitsyn’s short stories, to name a few. At the same time, Tan warned against importing directly from foreign sources without careful reflection (“we cannot just bring a house in from the outside”). Making it new through translation meant localizing it, or for Liang, using “the most modern of modern poetic expression” to “find a heightened realism” that fit their surroundings. Translation was seen as necessary to revitalize a decades-old Xinma (Singaporean and Malayan) tradition before it could leave its mark on world literature. Tan’s modernism implied that the Xinma poet would call forth literary resources both archaic and modern, universal and local, for a momentous new poetry (“My power is universal / Once completed, it will present / a monstrous construction”). Following the ‘60s modernist wave, Woon Swee Tin (Wen Renping) presented Collected Malaysian Poetry (1974), a landmark collection showcasing the opaque style of poets who privatized meaning and symbols in the likes of Ai Voon, Sha He, Lee Mok Heong (Li Mu Xiang), Wong Yoon Wah (Wang Run Hua), Li You Cheng, Chen Hui Hua, May Sook Chin (Mei Shu Zhen), and others. This allusive poetry, influenced by French symbolism, surrealism, and existentialism, was accused as decadent, self-indulgent, socially disengaged, and Westernized by Mahua realist critics of the time. But it attempted aesthetic renewal, setting itself against what Woon described as outdated forms (a “dried beancurd form”) and political expediency (“worker-peasant-soldier sloganeering”) of the realist tradition. As founder of the influential Sirius Poetry Society in West Malaysia, Woon anthologized representative poets from poetry organizations across the nation and overseas, such as the Silver Star’s Poets Society (North Malaysia), the Sarawak Constellation Poetry (Borneo/East Malaysia) and the Blue Star Poetry group (Taiwan), thus pulling together the diverse strands of a modernist uprising that was taking place in new Malaysia. Resisting clear, realist tropes, the poems in Woon’s anthology cleave to Western modernist styles and break with classical poetic structures, emphasizing a poet’s subjective consciousness. In Ai Voon’s “Stricken” (kun), deep ennui combines surreal argument with shortened syntax: “Outside the door the well women are drawing water / I hear them arguing over certain forms / Mocking shells falling on the slab / I am too tired to tidy them.” It ends with the pessimistic exhaustion of fin de siècle Western poetry: “And no matter what, wanted to leave my cough at the throat/I am so sad tears can’t be squeezed out.” Sha He’s poem, “Gear” (chi lun), uses object imagery to depict existential alienation and paranoia: “Gears are turning/in a cycle/stainless steel/run over your brain”), and compares life with “coming out of a toy shop” and its artificial, rootless nature to “groping in the dark of a tunnel.” The wavering poetic subject is evacuated from its own shadow when under threat, echoing 1950s and ‘60s existentialist literature. No less enigmatic, Lee Mok Heong’s (Li Mu Xiang) “Lips” (chun) is lighter and playfully recasts a woman’s bashful, desirous face with Buddhist allusions (“Look! A Buddha meditates in your pupil”) and classical Chinese motifs (“Her sitting posture is like a cloud / A mountain landscape”). Contrasting with the individual mythologization of the Generation of ‘68, they hinted at a bleak modernist turn that coincided with Mahua writers’ growing political uncertainty and frustration with cultural disenfranchisement in the 1960s and 1970s, as a string of historical events reshaped the political landscape of Malaysia. The 1969 racial riots and the ruling government’s National Cultural Policy in 1971 reorganized race relations and explicitly defined national culture as Malay. Other minority cultures became subsidiaries who needed to adapt and assimilate to the “indigenous culture of the region.” Mahua writers, both realist and modernist, attempted to come to terms with their minoritized position in Malaysia’s cultural sphere. Unable to comment directly on cultural politics due to official pressure, and facing increased encroachment on minority rights such as the contentious issue of vernacular education, Mahua writers struggled to find new, visionary ways engage this political environment. Some retreated to a poetics of exile (liu fang), and expressed its despair through classical Chinese figures like Qu Yuan, a third-century BC poet-minister, who upon his forced departure from the Chu state, eventually committed suicide in a river. In the mid-to-late 1970s and 1980s, several Mahua poets departed from the earlier localizing impulse of Bai Yao and Tan Swie Hian. Inspired by Taiwan modernism, their works emphasized a diasporic fascination with “cultural China” (wenhua Zhongguo). The idea of Mahua’s exile from an original “China” connected with some circles in post 1950s literary and cultural Taiwan, which grappled with the legacy of the flight of the Kuomintang and many literati to Taiwan after the communist takeover of China in 1949. The Woon brothers’ Sirius Poetry Society (Tianlang xing shishe) and its offshoot in Taiwan, the Shenzhou Poetry Society (Shenzhou shishe), heralded the Mahua modernist “third wave.” It was one extreme response to the cultural identity and literary debates that have been plaguing Mahua writers since the 1930s. The Sirius Poetry Society, formerly known as the Oasis Poetry Society (lüzhou shishe), appeared in 1967. Based in the West Malaysian state of Perak, it actively organized meetings and discussions about the latest modernist poetry from Taiwan, and published a small literary magazine called the Oasis Journal (lüzhou qikan). Woon’s Collected Malaysian Poetry (1974), as previously mentioned, resulted from Sirius members’ efforts to build a national network of like-minded poets with transnational—mainly Taiwan and Hong Kong—connections. Woon made visits to Kuala Lumpur, Malaysia’s capital, to establish links with Chao Foon and Students’ Weekly, hoping to cultivate an audience abroad for Mahua poetry, and position the Sirius group as successors to the “second wave” of Mahua modernism. 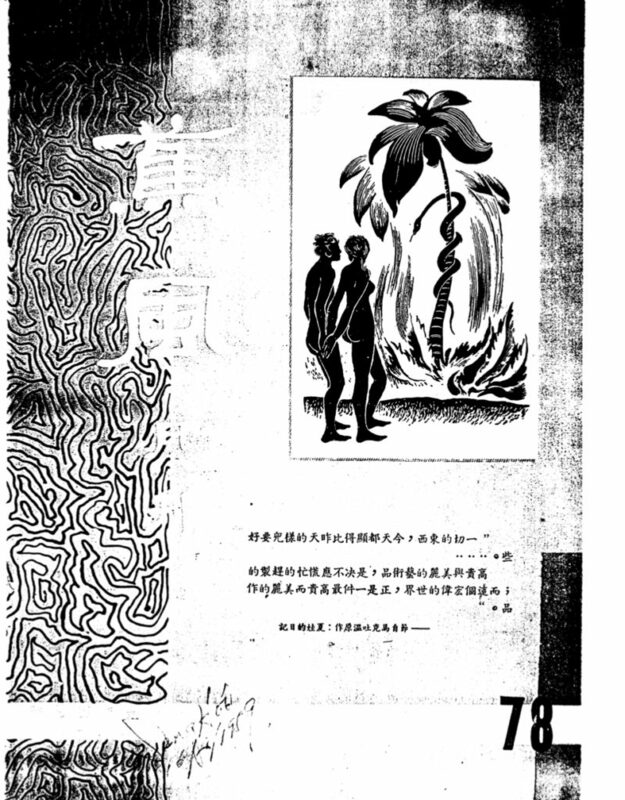 In 1972 and 1973, the Sirius Poetry Society was formally established with nine “branches” nationwide and started publishing small compilations of Mahua modernist works in Hong Kong and Taiwan. In 1974, Woon visited the World Congress of Poets held in Taipei, and met with founding poets of Taiwan modernism, such as Yu Kwang-Chung (Yu Guangzhong), Lo Fu (Luo Fu), Ya Hsien, and Chou Meng-tieh (Zhou Mengdie). In the same year, he became a Southeast Asian correspondent at Chung Wai Literary Quarterly (Zhongwai wenxue), a pioneering journal of comparative Chinese studies based in Taiwan. In 1973, Woon’s precocious and charismatic brother and editor of the Sirius group, Woon Swee Oan (Wen Rui’an), moved to Taipei to further his studies. He published the first edition of Sirius Poetry Magazine (Tianlang xing shikan) in 1975, consolidating the Mahua modernist presence in the Taiwan scene. The Woon brothers soon fell out. Woon Swee Oan established the Shenzhou Poetry Society in Taiwan in 1976, and brought with him many ex-founding members of the Sirius group, like Foong On-Chin (Fang Er Zhen), Wong Fon-Sing (Huang Hun Xing), Zhou Qing Xiao, Liao Yao Ping, and so on. While Sirius, under Woon Swee Tin’s leadership, continued to publish work both locally and abroad, Woon Swee Oan focused on gaining a foothold in the Taiwan scene, a fertile ground for his imagined “cultural China.” His youthfully angsty short essay, “The Dragon’s Cry from a Thousand Miles” (Long ku qian li) (1972), published when he was eighteen in Oasis Journal, prefigures his literary mission for Shenzhou writing to “save the nation” through an ancient “cultural China”: “You did not even turn your head while walking . . . each step waking the skeletons within this five-thousand-year-old land, under my feet they toss and and scream and roar, and do so until I depart”). Clearly for Woon, Mahua literature was a peripheral stream of “Greater China,” a view he would emphasize in his 1977 essay, “Discussing Mahua literature” (Mantan Mahua wenxue). Though modernist in form and diction, his early poetry collection, The General’s Orders (Jiangjun ling) (1974) took its title from an old Tang dynasty song and is peppered with classical Chinese images like zithers, swords, and robes. Foong On-Chin drew from classical Chinese painting and fiction to carve out space for female interiority. Her poetry collection Crescent Brow Rhapsodies (E mei fu) (1977) described themes of longing and romance which appropriated caizi jiaren (scholar and beauty) tropes, a staple of classical Chinese fiction. Closely linked to other university student-driven literary societies like the San San Literary Society, which counted canonical Taiwanese authors like Zhu Tianwen and Zhu Tianxin among its members, Shenzhou Society established a definite presence in literary Taiwan. It managed to parlay their Taiwanese brand of Mahua modernism into capturing Mahua people’s sense of alienation in 1970s Malaysia. The November and December 1974 editions of Chao Foon, for instance, were special issues on classical Chinese literature. Woon Swee Tin said in 1978, “I believe that modernism’s tradition can be traced to Songs of the South (Chuci). If my viewpoint is right, then the spirit of Qu Yuan stands on the upstream, and we stand on the downstream, continuing an ancient tradition.” Qu Yuan’s patriotic and poetic dissent captured the plight of Mahua poets like Woon Swee Tin, Zhang Shu Lin, Lan Qi Yuan, Ho Nai Kin (He Nai Jian), Fang Ang, and You Chuan. The stagnation and unfulfilled promise of Mahua modernism during its mid-to-late 1970s “Chinese turn” have been variously criticized. It flouted the pre-1970 “Malayan basis” of Mahua modernism in the vein of Tan Swie Hian’s works. The modernist project that had begun concurrently with a Malayan vision ultimately failed to transcend its ethnic basis. Its limited local and global impact today suggests that it has not lived up to its initial raison d’etre and hopes for translational writing, especially with other ethnic groups in Malaysia. As an archive of translation, however, it threads through diverse influences both in space (from East to West) and in time (classical China and Greece, Western and Chinese modernity)—traces of world modernisms that make it a unique cross-stream of influence. Even today, lexicographers Yang Quee Yee and his wife Chan Maw Woh are reprising their project of compiling Chinese-Malay dictionaries during the 1950s. Learning Malay was one way of being Malayan. If not, Chinese translations of Malay literature, however sporadic these efforts, were welcome pursuits. Around 1927, Yi Yi and Zeng Yuyang published the first translations of Malay folk songs and pantuns (Malay rhymed quatrains, or pantoums, as known in the West), as part of a growing Mahua climate to promote writing that reflects a “Nanyang (South Seas) flavor.” In 1961, scholar in Malay-Indonesian studies Leo Suryadinata (pen name Gu Yi) published the first volume of new Malay poetry in Chinese. The 1970s produced two notable Chinese translations of Latiff Mohidin (1973) and Said Zahari (1976). After the 1980s, Malaysian National Laureate (1983) Usman Awang, who championed Malay-Mahua cultural dialogue, would be the only Malay-language poet translated into stand-alone volumes in Chinese. The Mahua and Malay poetic traditions are by and large estranged, the legacy of postcolonial/post-1969 racial restructuring. Bilingual writer, translator, and literary critic Chong Fah Hing, however, suggests that “translational Mahua” (fanyi Mahua)—his phrase for Chinese translations of Malay literature—is a neglected archive whose influence on Mahua literary history is unaccounted for. In an ongoing effort to promote a Malay-Mahua translingual history of reading, Chong published his own translations of selected Malay-language poems from the 1950s onward, in a bilingual volume called Moon over Bukit Siguntang: A Collection of New Malay Poetry (2016). Introducing Chong’s book, Tee Kim Tong provocatively states that though many bilingual Mahua literati and academics operate in the Malay literary scene, the Mahua circle has yet to produce translators of Malay poetry at the level of Muhammad Haji Salleh or Harry Aveling (who translate into English). Chong’s anthology thus introduces a much needed Mahua voice to canonical Malay poets such as A. Samad Said, Baha Zain, Muhammad Haji Salleh, and Usman Awang; ethnic Chinese poets who write in Malay such as Awang Abdullah (Pui Tiong Gee) and Lim Swee Tin; and female poets such as Siti Zainon Ismail, Zurinah Hassan, and Salmiah Ismail, among others. In an email, Chong said that he chose to translate poems based on certain topics like “race relations” or “female consciousness.” Collectively, these 28 texts express what we can call “denationalized nationalism.” Suggestive are the tropes of intermarriage prior to the time of the nation-state, as in Muhammad Haji Salleh’s poem on Chinese princess Hang Li Po, who was married to Mansur Shah of the Malacca Sultanate (1400–1511), and cosmopolitan travel, as in Latiff Mohidin’s poems written in Germany, Copenhagen, and Vientiane (Laos), and Abdul Ghafar Ibrahim’s poem written in Chicago. Chong’s postscript brings up a Mahua-Malay version of the Pasternak/Tan event for Mahua poetic modernism. Famous Malay modernist poet and painter Latiff Mohidin’s first poetry collection, Sungai Mekong (1973), was published as a bilingual Malay-Chinese edition under the auspices of Chao Foon before its more formal release in Malay by the Malaysian National Language and Cultural Board (Dewan Pustaka dan Pustaka, or DBP). Tan Swie Hian, in an essay “Between Form and Spirit: On Literary Translation,” recalls that his and May Sook Chin’s collaboration with Latiff had directly transformed the poet’s creative process. But Chong also contrasts the Malay and Mahua poetic traditions. While Latiff’s modernist poems evoke the real through images of native soil, Mahua modernist poetry of the ‘60s and ‘70s feels displaced from their spatial locale and reality. In May 1971 (Vol. 220), Chao Foon dedicated an entire issue to discussing and translating modern Malay-Indonesian literature and poetry, giving an extensive overview of its development and important figures. These collaborations and readings across languages in Malaysia furnished cross-racial and cultural modernism abetted by translation, which aimed to bridge historically conditioned estrangement. If Mahua poetic modernism connects globally to the West via Taiwan and Hong Kong, Chong’s volume implies that though scattered, the post-1950s Malay-Mahua poetic alliance of anti-colonial solidarity, wherein translation between both traditions bears its marks, is an important one. Shared localization has been largely forgotten and insufficiently examined. This return to a local poetics of “denationalized nationalism” views the immediate postcolonial setting as a missed opportunity for cross-cultural solidarity. We hope that attending to this history will encourage Mahua poets to turn to the local as a resource to revitalize their tradition, if they have not already done so. Perhaps by doing so, they can restart dialogue in an ethnically fractured local scene, and push for recognition of its uniqueness on the world stage. Fah Hing, Chong.Xikun shanming: Malai xinshixuan; Bulan Muda di Puncak Siguntang: Antologi Pilihan Puisi Baru Melayu [Moon over Bukit Siguntang: A Collection of New Malay Poetry], Dream Eater (2016). Boon Eng, Khor. “Mahua literature’s trinity: Chineseness, locality and modernism’s isomorphic relationship” [Mahua wenxue zhong de san wei yi ti: Zhongguo xing, bentu xing yu xiandai xing de tonggou guanxi] in The Modernity of Malaysian Chinese Literature [Mahua wenxue yu xiandai xing], edited by The Federation of Alumni Associations of Taiwan Universities, Malaysia [Malaixiya liutai xiaoyouhui lianhe zonghui] (2012). Kien Ket, Lim. “Why Mahua literature?” [Wei shenme Mahua wenxue?] in A Malaysian Chinese Literature Reader (II): Equatorial Echoes [Chidao huisheng: Mahua wenxue duben II], edited by Chen Dawei, Zhong Yiwen, and Hu Jinlun (2004). Kim Tong, Tee. “Sinophone Malaysian literature: An overview” in Sinophone Studies: A Critical Reader, edited by Shu-mei Shih, Chien-hsin Tsai, and Brian Bernards (2013). —, “Tan Swie Hian, Translation, and Mahua modernist literature” in Studying Southeast Asian Chinese: Sinophone Malaysian literature and cultural identity [Nanyang Lunshu: Mahua wenxue yu wenhua shuxing] (2003). —, “Baiyao and Mahua Literature’s first modernist wave” [Baiyao yu Mahua wenxue de diyi bo xiandai zhuyi fengchao] in Wenyi, Nanyang Siang Pau (Nov. 2008). Kim Chew, Ng. “Shenzhou: cultural nostalgia and the inner China” [Shenzhou: wenhua xiangchou yu neizai Zhongguo], in Malaysian Chinese Literature and Chineseness [Mahua wenxue yu Zhongguo xing] (1998). —, “Chineseness and cultural performativity – discussing the limits of Mahua literature and culture” [Zhongguo xing yu biaoyan xing – lun Mahua wenxue yu wenhua de xiandu] in A Malaysian Chinese Literature Reader (II): Equatorial Echoes [Chidao Huisheng: Mahua wenxue duben II], edited by Chen Dawei, Zhong Yiwen, and Hu Jinlun (2004). Swee Tin, Woon. “The Sirius Poetry Society and Mahua Modernist Literature Movement” [Tianlangxing shishe yu mahua xiandai wenxue yundong] in A Malaysian Chinese Literature Reader (II): Equatorial Echoes [Chidao Huisheng: Mahua wenxue duben II], edited by Chen Dawei, Zhong Yiwen, and Hu Jinlun (2004). Guang Da, Zhang.Studying Malaysian Chinese Modern Poetry: Literary Culture, Context, and Identity. [Mahua xiandai shilun: Shidai xingzhi yu wenhua shuxing] (2009). Yao, Bai. “The New Revolution of New Poetry” [Xinshi de zaigeming], in The Chao Foon Monthly [Jiao feng], vol. 78 (April 1959). —, “Standing Quietly by the Muar River” [Mahe jingli] (1958). Swie Hian, Tan. “Variation no. 3”, translation of Boris Pasternak’s poem, in Wenyi, Nanyang Siang Pau (March 1967). —, “Preface”, The Giant [Ju ren] (1968). —, “The Giant” [Ju Ren], (July 1966 version). Collected Malaysian Poetry [Dama shixuan], edited by Woon Swee Tin (1974). Swee Oan, Woon. “The Dragon’s Cry from a Thousand Miles” [Long ku qian li] (1974). —, The General’s Orders [Jiangjun ling] (1974). On-Chin, Foong.Crescent Brow Rhapsodies [E mei fu] (1977). Latiff Mohidin.Mekong River [Sungai Mekong], bilingual edition translated by Tan Swie Hian and May Sook Chin (1973). Zhou Hau Liew completed his dissertation on Malaysian Chinese history and literature at the University of Pennsylvania. His writings have appeared in Kisah Journal, The Wknd Sessions, and Esquire Malaysia. He splits his time between New York and Kuala Lumpur. Zhou Sivan has written two poetry chapbooks, Zero Copula (Delete Press, 2015) and Sea Hypocrisy (Doublecross Press and Projective Industries, 2016). His recent work can be found in Lana Turner, Chicago Review, Dispatches, Kisah Journal, Almost Island, Asian American Writers’ Workshop, and Asymptote. He lives in Chicago.